Olmstedville; Elmer M. Lynn 77, passed away Tuesday January 6, 2016 at the West-Mount Health facility in Queensbury, NY., with his loving family by his side. 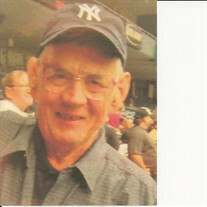 Elmer was born October 20, 1938 in Olmstedville, NY the son of the late Harold and Beatrice (Olden) Lynn. Elmer was also predeceased by his sister Edna Dubay and his niece Valarie. Elmer worked at several saw mills in the Olmstedville area, Great Eastern and Kelly's among them. He also worked at North Creek Wood Workers. Elmer was a huge New York Yankee fan, attended many rodeos, and also enjoyed attending Minerva Central High School games in the area. He loved horses and riding and owned a few horses during his life time, he also liked snowmobiling with family and friends. Elmer is survived by his sisters Eleanor (Butch) Whipple of Olmstedville and Ester (Jim) Hagadorn of Saratoga, his brother Ernest of Olmstedville. He is also survived by 7 nieces and nephews, 8 great nieces and nephews, and 7 great great nieces and nephews. A Funeral Service will be held Tuesday morning January 12, 2016 at 11:00 AM at the Edward L. Kelly Funeral Home 1019 US Rt.9 in Schroon Lake, NY. Interment will follow in the Federal Flats Cemetery in Olmstedville. Family and friends may call at the funeral home Monday January 11 from 2:00 until 4:00 and 6:00 until 8:00 PM. The family suggests memorials take the form of donations to the Minerva Volunteer Fire Department and Rescue Squad, Minerva, NY , or the Minerva Central School Athletic department, Minerva, NY.